From seamless design to professional installation, Ultrapure Technology is the industry’s leading specialist for any style of clean room project. The company’s experienced team has the knowledge, the capability, and the experience to assure clients receive the ideal solution for their unique modular clean room application requirements. At Ultrapure Technology, clients have the benefit of working with the same team for both clean room design and installation. This means that the team already knows how each element of the project will fit together before even beginning the clean room construction process. In addition, because they have this inherent understanding of the products and the processes involved, the team at Ultrapure Technology can also complete the clean room installation job within an industry-leading turnaround time, providing clients with more cleanroom uptime to allow them to quickly begin gaining a return on their investment. As an organization, Ultrapure Technology understands that a cleanroom project might require special supplies that aren’t readily available off-the-shelf. With that in mind, they go to great lengths to source high quality products such as maintenance solutions, furniture, wipers, apparel, and other specialty items for their comprehensive company catalogue of clean room supplies and equipment. Those with existing cleanrooms can also take advantage of Ultrapure Technology’s cleanroom construction expertise to achieve superior working efficiency. For clients that require a retrofitted cleanroom solution such as an updated HVAC system or soft wall construction, Ultrapure Technology can provide the requisite construction service. 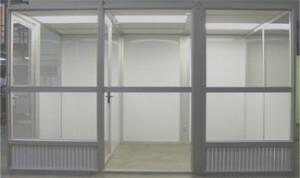 Choose Ultrapure Technology for modular cleanrooms that set the standard for affordability and efficiency. If you have a cleanroom project on the horizon, give Ultrapure Technology a call: 800-932-0309. You can set up a free on-site evaluation with our clean room design experts. Looking For USP 797 Compliance? Well you’ve come to the right place! For more information as well as examples of Typical Turn-Key solutions, please visit our USP 797 Compliance page. You will need to have Adobe Acrobat Reader installed to view PDF documents. Click Here or on the icon below to download Adobe Acrobat for free.